Italian avant composer Giacinto Scelsi (1905-1988) is primary known to us from the works of his second period of compositions, which began in 1952 and continued into his later years. In this period he rejected his earlier composition methods to concentrate on sound color, micro-intervals and reduced intervallic relations. His chamber and vocal works of this period are the most widely performed. 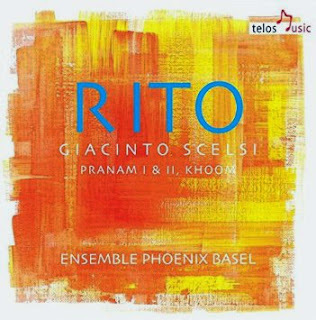 Ensemble Phoenix Basel and vocalist Marianne Schuppe give us a lively program of five Scelsi works from that period in the recent album RITO (Telos 191). Two of the five works include a vocal part, which Ms. Schuppe handles quite adroitly with expressiveness and nuance. "Khoom" (1962), for soprano, French horn, string quartet and two percussionists is the longest work (at 22 minutes) and gives central place to the vocal part and its pivotal centering around a series of pitches, micro-intervals and use of vibrato for expressive purposes. "Prana I" (1972) for alto, 12 instruments and tape recorder masses the largest ensemble of all the works here. It too has a very prominent vocal part and a sort of ritualistic use of limited pitches and microtonal permutations in highly dramatic, coloristic ways. "Prana II" (1973) is a sequel for nine instruments. It uses long tones and coloristic elements to give us a soundscape even more stark than "Prana I" yet continuous with endless permutations around somewhat limited means tonally. If you speak of "minimalism" there are times where Scelsi is much closer to the visual equivalent in the art world than the composers given that categorization. Yet as here the coloristic and microtonic elements give us quite a bit of variability. "Riti: I funerali di Alessandro Magno" (1962) has a dark cast, due in part to the instrumentation of contrabass, tuba, electronic organ, contrabassoon and percussion. Scelsi's treatment accentuates the tendency further with dramatic long-tones and a limited pallet of notes often low in the range of the instruments. "Okanagon" (1968) concludes the program with some striking music for harp, tam-tam (gong) and contrabass that has an especially resonant sound as seemingly the strings of the harp and contrabass are allowed to vibrate against the tam-tam at key points. It at times reminds of Tibetan chants and their vibrating cymbal interludes and low throat-tone vocalizations. For "Okanagon" the sound color is vividly present and quite beautiful in a distinctive way. I suppose that this group of works and their fine performances are as good a place as any to start with Scelsi's music if you do not already know it. And even if you do, this is a volume very much on target. His is a new music that does not aim to please as much as get inside the production of sound and its mysteries. So it's best to leave expectations behind. Any new music lover with a game spirit about travelling to unknown sound worlds will find this volume very interesting I would think. No understanding of 20th century innovations is quite complete without Scelsi. This is music of importance, very well performed. Contemporary orchestral music runs a gamut of styles. Today we get a sort of neo-romantic programmatic music with pronounced traditional Chinese elements entering into the mix. Ge Gan-Ru (b. 1954) is at center-stage for the two-work CD Shanghai Reminiscences (Naxos 8.570609). He was born and raised in Shanghai and now lives in the New York area. 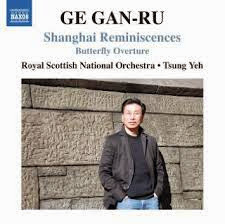 He apparently has written music in an avant mode but now turns to something mostly more conservative for the lengthy "Shanghai Reminiscences" (2009) and the briefer "Butterfly Overture" (2012). Frankly, my first hearing of this disk was somewhat dismissive. The longer work follows on the path of an autobiographical tone poem about growing up in Shanghai. This is quite a bit more programmatic than what we are used to hearing nowadays, a sort of "Hero's Life" only even more literal than Strauss. So each segment depicts something in various ways, the sound of birds and a Sibelius-reminiscent dawning segment (that returns in the end), practicing scales (and yes, you get scales), street sounds (car horns), brief portraits of street pedlars, the storm and stress of the Cultural Revolution, everything laid out like a movie soundtrack, some of the thematic material inventively romantic, some Chinese, some close to banal but all easy-to-digest. The "Butterfly Overture" features a chromatic scale to depict literally the path of the butterfly. As I say, the first hearing, though the performances are fine, did not leave me wanting more. The Chinese elements were the more interesting parts. Some of the western romantic parts left me cold. The biographical reflex-music was sequential and not perhaps structurally meaningful. But then as I listened more there were parts that hit me as interesting, that there was here and there a real spark of something original to recognize. Now I listen with more interest than at first hearing. It should certainly appeal to those who respond well to a literal program, who perhaps need the obvious meaning guideposts to get them through a long orchestral work. And I am no longer dismissive. If based on this I say I appreciate Tan Dun all the more as my favorite living Chinese composer, I do think that Ge Gan-Ru is worth hearing. I would like to hear his more modernist works and see what he comes up with in the future. This album I'll play again, certainly. He has a way. It's not entirely my cup of tea, perhaps, but you cannot please everybody. Peter Maxwell Davies (b. 1934) surely is one of the towering figures among living English composers. The systematic release of nearly all of his works (most originally on Collins Classic) on Naxos has helped me understand that. It perhaps is in the miscellany that a composer shows his or her value across-the-board. But it isn't always fair to judge on those. If we only knew Beethoven from "The Creatures of Prometheus" we would be missing a great deal. Nonetheless it can be fascinating to explore an artist's byways. 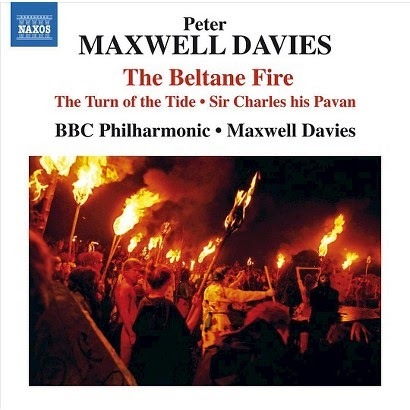 With this in mind we turn to Peter Maxwell Davies and his recent reissue volume The Beltane Fire (Naxos 8.572362). It is indeed a volume of miscellany. This is a series of orchestral works from the late '80s through the middle '90s. It includes the ballet that never came to be ("The Beltane Fire"), running nearly 40 minutes, the near half-hour work "The Turn of the Tide," and several short works: "Sunday Morning," "Threnody on a Plainsong for Michael Vyner," and "Sir Charles his Pavan." For all of this the BBC Philharmonic under the composer takes care of the performances, and quite respectably at that. "Tide" brings in several boys and girls choirs for a portion of the work. There is good craftsmanship and inspiration readily to be heard here. The "Beltane Fire" has advanced harmonic modernity and a great variety of music, some obviously meant for the dance, some less so. It sounds much like the Maxwell Davies of the period, exploratory yet steeped in an orchestral expressiveness of the Maxwell Davies sort. "The Turn of the Tide" is symphonic narrative in a slightly less modernistic vein. The entrance of the choirs towards the end makes for some beautifully evocative music, rather brilliant and at times colloquial, a high point of the disk for me. "Sunday Morning" is the expanded version of a theme for a BBC radio program. It is bright and pastoral sounding with a slightly regal cast. A little gem. "Threnody" has a contemplative sadness and a resigned sort of quietude. "Sir Charles his Pavane" was written for Charles Groves, the conductor who championed Maxwell Davis early on. It continues the quiet mood with well conceived parts for brass and strings. That pretty much sizes it up. It is a volume that will certainly add to your Maxwell Davies appreciation. If it does not form the capstone of his works from this period it does provide an absorbing diversion. This would be by no means the first to get of his many volumes now on Naxos, but it is quite contentful nonetheless. 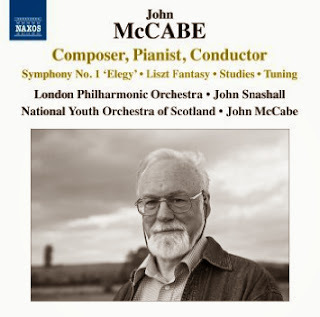 English composer John McCabe (b. 1939) makes music with a very personal stamp, modern sounding yet in a continuity that suggests earlier styles without seeming neo-classical. I came across his Visions, Choral Music and posted positively on it here last December 14, 2012. Now we have a goodly assortment of works in a new anthology composed of recordings originally released on LP or cassette and now for the first time joined together on a single CD. Composer, Pianist Conductor (Naxos 8.571370) gives us an orchestral work and solo piano music composed between 1965 and 1969, then closes out with an orchestral work from 1985. As the title suggests McCabe is the pianist for the three solo piano works included, which are "Fantasy on a Theme of Liszt" (1967), "Capriccio (Study No. 1)" (1969) and "Sostenuto (Study No. 2)" (1969). All three works are dynamic, dramatic and occasionally call for a virtuoso ability that McCabe delivers quite readily. They have substance and dash. The Liszt "Fantasy" sounds like a potential classic. Then there are two orchestral works, his "Symphony No. 1 'Elegy'" (1965) and "Tuning" (1985), the latter with McCabe as conductor of the National Youth Orchestra of Scotland; the former with John Snashall conducting the London Philharmonic. "Tuning" makes use of a large orchestra for a kaleidoscope of modern tonal color soundscaping with mystery and texture. It shows you a very adventurous side of McCabe that pleases while orchestrationally giving off a brilliance that makes you wish there was more like it. Another CD? The Youth Orchestra may not be the Vienna Philharmonic but they give us a clear idea of the work. His "Symphony No. 1" has three movements and an evocative quality a bit less avant than the later work but very well conceived and compelling in any event. Once again his orchestrational creativity comes to the fore. Altogether this anthology gives you much to appreciate. It presents you with a snapshot of a composer we would do well to hear more from. Recommended for completists in the new music contingency but also for those a bit less avant-oriented, as the music fits its own world that partakes of 20th-century tradition and avant qualities equally and satisfyingly. Here is an English composer of merit. My own personal list of the best organ composers of the 20th century would place Messiaen at the very top. I am not alone in that feeling. He left us a body of organ works like no other. His combination of spirituality, his keen sense of what the modern cathedral organ can do and his compositional brilliance make for striking music that is modern yet partakes in the grandeur of the French Organ school as beginning with Franck through to his era. La Nativité du Seigneur (The Birth of the Saviour) was one of his comparatively early works, written in 1935, yet it is also a masterpiece. There have been a number of recordings. Tom Winpenny gives us a new one (Naxos 8.573332). Along with the great Naxos price, this version is an excellent one. The old Candide LP anthology of organ music played by Reynaud if I am not mistaken included the final movement of this work. 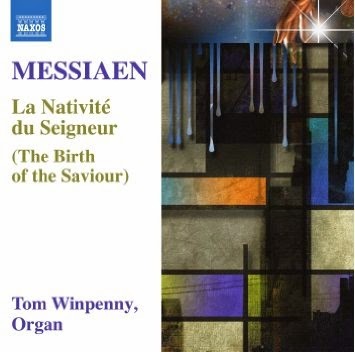 It introduced me like so many others of my generation to Messiaen's organ music. Judging by that movement alone Winpenny is very competitive. And based on my ears alone the rest of the performance is sensitively and passionately realized, very much characteristic of what Messiaen should sound like. The work in its entirety is filled with color and contrast, mystery and triumph. Like any of the major Messiaen organ opus works it is "spooky" in its way, modern in ways often typical of early Messiaen yet with a special feel for how the organ can envelope listeners in a world of sheer sonic sensuousness. I would not hesitate to recommend both the composition and Winpenny's performance. In fact I entirely do. Any student of 20th century organ, of Messiaen, or of modernism in general should have it. I am glad for it myself! Modern works that pay homage to or utilize the music of past masters in an overt manner are not of course unprecedented. I can think of Stravinsky's tribute to Gesualdo for one. There are others. The practice goes back to pre-modern times. The key is in the doing of course. 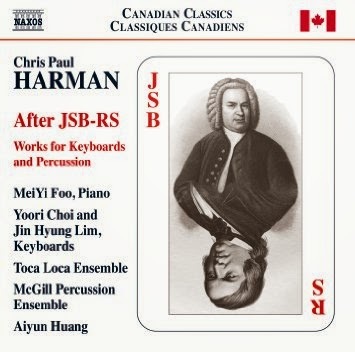 Canadian composer Chris Paul Harman (b. 1970) transforms source materials from Bach's "Chorales" and "Two Part Inventions," and also two piano cycles by Robert Schumann on his After JSB-RS (Naxos 8.573303) in a series of five chamber compositions for piano(s) and percussion. The music that results is memorable and very interesting, modern with at times bit of a bite so to speak, atmospheric in ways that do not copy but are in the lineage of Messiaen and Crumb perhaps, and quite inventive. It is the sort of thing where the music is so transformed that if you didn't know the sources you would mostly not notice them, so thoroughly re-thought is the music. The five works span the recent period between 2006 and 2013 and as such show the composer in a very productive mode. Central to the music is the standard piano, augmented by at times an untempered piano, toy piano, and prepared piano, which gather in various configurations in "After Schumann," "371" (this one especially vibrant in sound), and "After Schumann II." Each piece gives you a transformed coloristic palette of tones that belies their origins and creates beautiful patterns largely outside traditional harmonic-melodic classical form. The "Concertino" from 2008 is perhaps the most ambitious, a short, four-movement work with a fascinating series of moving lines played by the McGill Percussion Ensemble emphasizing the vibrant color of bell-chime sonorities with celeste, piano and such. "Der Tag mit seinen Licht" is one of the more stunning works. Scored for piano, flute/piccolo, clarinet/recorder, violin, cello and percussion, it uses a core motif that then extends outward into beautifully expanded continual modulation with disjointed diatonic intervals that when put together do not fall easily into a key center or linear harmonic continuity. It is based on the Bach "Chorale" of the same name. It most certainly is a joy to hear. This disk offers up some refreshing yet rather profound sound-forms that gives us a tonality at times highly extended and always as an alternative to classical form. Most times this is music that should be accessible to many in its poetic qualities and generally sonorous result. Yet the confirmed modernist will get much pleasure following the colors and permutations. The performances are excellent, too. Chris Paul Harman is a composer to follow. This is a great starting point. In terms of sheer sound, there is more than one John Cage. There are many. Some of his works are dissonant or noise-sound oriented; there is the "ethnic" Cage of the prepared piano pieces; there is the diatonic Cage who shows a Satie influence; and there are vocal works that have a sort of ritual diatonics. There are other Cages, too. But for now that's enough. 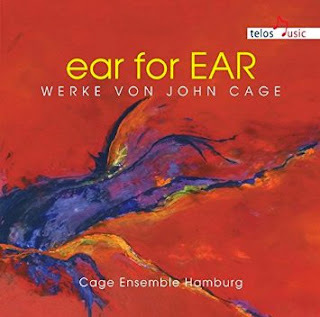 Cage Berlin Ensemble Hamburg has a new collection out of his music entitled Ear for Ear (Telos Music 179). It is centered around music that has as its basis a text. Most of these feature vocalizing of that text; one is a piano work that was influenced by a text. Much of the music here has enjoyed a good number of recordings. That is in part because much of it is very accessible. Some are more rare. All are well performed in his recording. "ear for EAR" (1983) for two voices is, as the liner notes state, similar to "Litany for the Whale" (1980) for a single vocalist, in that both have a chant-like diatonicism based on syllables. "ear for EAR" is not as often heard as "Litany" but they go together well. "Three Songs" (1933) for voice and piano is one of Cage's first compositions. Based on texts by Gertrude Stein, it shows you a proto-Cage in a mostly diatonic vein, closer in approach to the "new music" of the time yet a thing already apart. "The Wonderful Widow of Eighteen Springs" (1942) was especially well sung by Catherine Berberian. It has percussive parts where the singer strikes a closed-lidded grand piano with his or her hands. It has an ancient Asian ritual feel with text from Joyce's "Finnegan's Wake." On Berberian's untimely death Cage wrote a very brief sequel to the work in her memory, "Nowt Upon Nacht" (1984), which is more dynamic but based on the same premises. It is good to hear both works together. "ASLSP" (1985) for piano solo is also based on "Finnegan's Wake" but is purely instrumental. It has eight brief movements and is more typically jagged in Cage's abstract style. It has a quietude though that makes it fit in with the program well. "The Year Begins to be Ripe" (1970) is based on Thoreau and very briefly follows in the ritualistic mode of "Widow." The last work represented here is "Experiences 1 + 2" (1945-48), which maps out for two pianos his more "ethnic" pentatonic style and has a sung part based on the poetry of e e cummings. That is the run-down on what you will hear. The vocalists and pianists give us beautiful versions of the pieces, perhaps a bit more reverent and earnest and perhaps also a little less "new agey" as some recent versions of this music. And then you also get some rather rare pieces. This is the "mellow" Cage that potentially appeals to a very wide audience. But it is hardly for that bits of fluff. This is as serious as any Cage work is in intent. The sound is melifluent in at times archaic ways but always intriguing. Cage Ensemble Berlin give us this music with real devotion and focus. And so the results are rather outstanding. Leonardo Balada, Symphony No. 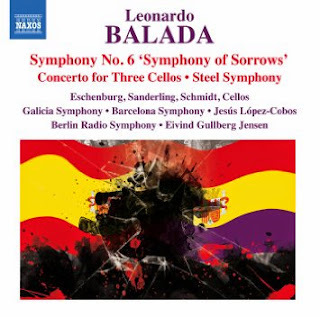 6 "Symphony of Sorrows"
Looking back to the experience of his music through the years, there is something about Spanish composer Leonardo Balada (b. 1933) that now hits me. That is, that I've enjoyed just about every orchestral composition I have heard of his, yet in the end I do not have a clear feeling for what to expect from him stylistically. Part of that of course is that his music continues to evolve and change. The new Naxos release of orchestral works is a case in point. It features his Symphony No. 6 "Symphony of Sorrows" (Naxos 8.573298) (2005), a "Concerto for Three Cellos and Orchestra, 'A German Concerto'" (2006) and his "Steel Symphony" (1972). The first two works enjoy here their world premiere recordings. The composer himself remarks in the liner notes that a key to his music is his use of avant garde techniques to forward emotional expression. That does help to explain in part. And you can hear that pretty clearly in these three works. "Symphony No. 6" is in remembrance of the innocent victims of the Spanish Civil War. It begins with a rather anguished expression by the orchestra, then takes up an almost martial rhythm that is tonal and polytonal at once. The "Concerto for Three Cellos" features Michael Sanderling, Wolfgang Emanuel Schmidt and Hans-Jacob Eschenburg in the expressive solo roles. It too begins expressively, then segues into poly-tonal music that has a regular cadence, perhaps also march music that is both avant and banally carnivalesque, "folksy." It concerns the long path of reconstruction in Germany after two disastrous wars and an evil dictatorship. The earlier "Steel Symphony" (1972) gives us Balada's impressions of Pittsburgh as a result of his residency there. It is a vibrant work that represents the turmoil and bustle of the steel factories and does it well. It is a molten cauldron of sound at times, fittingly expressing with brilliance the full tilt of production. All three symphonies have plenty of substance and vivid contrasts. If I still feel that I have yet to wrap myself around Balada fully, it is probably as much a matter of taking stock via a more-or-less full opus listening survey that I find worthwhile in gauging a composer. The performances here are stirring and fully detailed. Each work is tackled by a different orchestra: the Barcelona Symphony Orchestra under Jesus Lopez-Cobos for the "Steel Symphony," The Galacia Symphony Orchestra under Lopez-Cobos for No. 6, and the Berlin Radio Symphony Orchestra under Eivind Gullberg Jensen for the Concerto. For those first experiencing Balada this may not be the ideal recording. Perhaps the Naxos recording of the "Caprichos No. 1 & 5" (see review of March 14, 2012) would be better. Nevertheless the three works represented in this new release intrigue and expand our appreciation of Balada in worthwhile ways. The "Steel Symphony" alone is worth hearing. But the newer works open up vistas for us as well. When an anthology of works contains music of different style periods, either it is primarily a showcase for the artists involved or there are similarities in the works that go beyond the periods represented, or both. 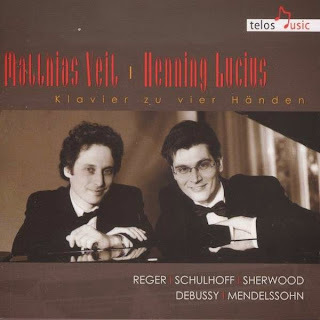 In the case of Matthias Veit & Henning Lucius's Klavier zu vier Handen (Telos Music 063) it is mostly a matter of artistry. The five works presented on this disk have in common the four-hand piano configuration and the artistry of the duo, which is considerable. The works themselves do not fit neatly into either period or stylistic affinities. They do not clash, certainly. But they give you variety and show off the interpretive skills of the pianists. And the sequence of the works flows nicely, too. Max Reger's "Sech Walzer op. 22" gives us an example of the composer somewhere between his late-romantic and his neo-classical style with brevity and charm but no sentimentality. Erwin Schulhoff (1894-1942) and his "Ironien op. 34" is a more modernistic, brittle sort of multi-part work, with a ragtime-modern final movement. Both contrast nicely. The program moves on to Gordon Sherwood (1929-2013) and his "Sonata in Blue, op. 66" in its recorded premiere. The music uses the blues scale tonality for more classical aims, in a way like Gershwin, only not as romantic-expressive as, say, the latter's "Rhapsody in Blue." And that is well, since it convinces on its own terms. Debussy's "Ballade" (1890) is extraordinarily lyrical and characteristic of the composer in this period. The four-hand version is especially full. We end with Mendelssohn's "Duett: Andante und Allegro vivace assai op. 92" from of course the previous century. It is a work in every way worthwhile and quite Mendelssohnian, and a contrast to the previous music in the program in its pre-modernist charm and slightly more virtuoso stance. The sensitive interplay of Veit and Lucius makes it all work. The Reger, Schulhoff ad Sherwood are well worth hearing in these fine renditions; the Debussy and Mendelssohn well done. In all the program has great variety, shows us five excellent examples of the four-handed art, and showcases the very musical approach of Veit and Lucius. Bravo! The PRISM Quartet is an all-saxaphone ensemble dedicated to traveling the fine line between advanced modern jazz and new music. 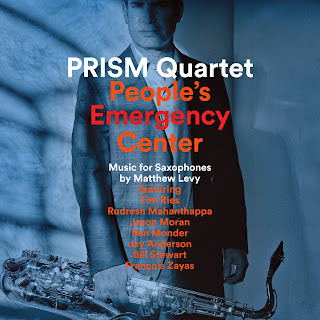 Their double-CD set People's Emergency Center (Innova 890) gives us 12 compositions by leader-tenor saxophonist Matthew Levy. They venture far into territory that isn't well-charted and we are fortunate that Levy's music gets such a thorough showcasing here. The core unit is Levy, Timothy McAllister, soprano sax, Zachary Shemon, alto sax, and Taimur Sullivan, baritone and bass saxes. Added to the quartet depending on the composition are guest artists, some jazz luminaries in their own right, such as Jason Moran, piano, Jay Anderson, contrabass, Tim Ries, soprano, Rudresh Mahanthappa, alto, Ben Monder, guitar, plus drums, percussion and what-have-you. Every work has its own trajectory; jazz, jazz-rock, new music all intermingle deftly under Matthew Levy's acutely vital compositional conceptions. There is room for improvisation at times as there are also times when a rhythm section drives things. A detailed description of every piece would be tedious as they all have their own bold way. Suffice to say that the quartet is pivotal and made extensive use of for modern voicings and textures which the special guests supplement and extend. It is music to satisfy the adventurous soul open to new fusions and extended "third stream" sophistications. It stands out as some very excellent new jazz-new music no matter which area your ears are most accustomed to, if not of course both. This is a group with a long-standing devotion to new sounds with an outstanding track record. I reviewed their 20th anniversary CD Dedication on these pages last January 10, 2012. 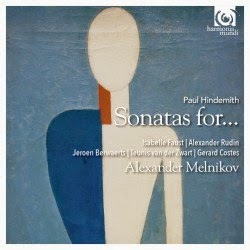 Hindemith, Sonatas for..., Alexander Melnikov, Isabelle Faust, etc. Hindemith's sonatas for piano and diverse instruments are one of the joys of 2oth century modern music. He wrote more than 30, covering the period between 1935 and 1948. Some of the best and also some of the rarest are lovingly performed by pianist Alexander Melnikov and select soloists on the newly released Sonatas for... (Harmonia Mundi 905271). We get his "Sonata for Althorn and Piano," which is good but not often performed. (Hindemith for musical recreation played the instrument himself with his wife at the piano.) It is a sort of horizontalized brass instrument that sounds something like a baritone or French horn. We get five sonatas in all, for althorn, cello, trombone, violin and trumpet. Alexander Melinkov is the constant at the piano. He plays with the dexterity and verve of a master, with a real feel for the spirit of the music and at times a virtuosity that is remarkably fleet and dynamically alive. Isabelle Faust (violin), Teunis van der Zwart (althorn), Alexander Rudin (cello), Gerard Costes (trombone), Jeroen Berwaerts (trumpet) all turn in rather marvelous performances. I've lived with these works (save the one for althorn) for many years in various versions and I must say that these with Melnikov are some of the very finest I've heard, perhaps the finest of them all. The music comes very much to us with all the enthusiasm and spirit you could ask for. This is stirringly beautiful music and you will find it very difficult to top this recording of them! Hong-Kong born composer Stephen Yip comes to us today in a judicious anthology of chamber works entitled Dark Side of the Shadows (Ablaze 00016). There are six recent works represented, composed between 2008-2013. All are post-serial modernist in style, with a prominence given to event-gestures and sound colors in a tonal framework that is sometimes at the edges, other times within a kind of quasi-archaic ritual primality. The disk opens with the work for which the album is named, for bass clarinet, cello and piano. It is colorful, craggy and has a charm born of advanced tone production and an excellent sense of aural space. "Color Valley" takes solo cello as its means of expression and does something similar. "Yugen," for flute, bass clarinet, violin, cello and piano stays a bit more around a key center and dramatically gives forth with music that has the pacing and feel of traditional Chinese classical yet also is firmly based in modernism. That Yip can do this with real torque and vibrancy of color is an example of his brilliant ingenuity. This work glows with character. "Cloud Color II" brings violin and cello to the forefront with double stops and an almost ritualized sense of sound and silence. Once again sound color is a central aspect of the work, with full use of various ways of sounding the instruments integrated into a dramatically gestural syntax. "Distant Voices" for string quartet begins in a way where "Cloud Color II" leaves off, with primal voicings articulating focused aural color. It has a meditative deepness to it that certainly forms an important part of what Stephen Yip is all about in these works. "Postlude: Etenraku" utilizes a wind ensemble for a short finale to the program. It has a sound panorama that is the most expansive given the fairly large group of instrumentalists. It unfolds with a beautifully conceived use of percussion to punctuate and the winds to articulate fans of chordal color that are fascinating to hear. Rather brilliant!! Stephen Yip has an extraordinary way of creating a post-Darmstadtian modernism that incorporates his Chinese roots with a subtlety that gives us a vivid experience of the inner colors of an advanced spatial sense. It leaves us with a feeling of focused tranquility. He is a genuine voice in new music today. Those who embrace the new will want to savor this volume. The performances are first-rate and the music original and excellent. If someone were to ask you, "What is the most famous orchestration in classical music?" 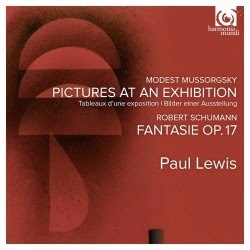 you would probably come up with Ravel's treatment of Mussorgsky's "Pictures at an Exhibition." It is so well done, so brilliant, that from our repeated hearing of the orchestral version it is almost inconceivable to imagine the work without those elements Ravel contributed. Yet of course the work existed for quite some time as something for solo piano only. Mussorgsky made considerable demands on the pianist who would play it. And in the face of us all hearing the work now with all the orchestral elements, it takes a special pianist, one with considerable virtuoso skills, power, and subtle interpretive acumen to make the work live as it did in Mussorgsky's mind. Such a pianist is certainly Paul Lewis, a master who we have covered on these pages before (type his name in the search box above), and we encounter once again in full-bloom. His Pictures at an Exhibition (Harmonia Mundi 902096) is available this month, coupled with Schumann's "Fantasie, op. 17." It hit me as I listened to Maestro Lewis's very lucid reading of the work just how bold the music must have sounded to contemporaries at the time. Romantic, very Russian, yet also filled with stridencies and at times a sort of hardness of attack that, without the orchestration to expand it, must have seemed rather unidiomatic, at times violent, furious. Looking back over time it takes an effort to hear it with fresh ears. With Paul Lewis at the piano giving the music a very poetic spin we can do this. "Ballad of the Unhatched Chicks," for example, soars under Maestro Lewis's fingers. Of course the "Great Gate at Kiev" and "Samuel Goldenberg" have that almost eccentric quality that is pure Mussorgsky. It takes a Paul Lewis to remind you and he surely does. Schumann's "Fantasie" goes well with the Mussorgsky as contrast. It is a work that never fails to move me but in Lewis's hands it does so even more than ever. There is a turbulent, boiling quality to the work that Lewis brings to us without restraint. And there are majestic moments that in their own way parallel "Pictures." Paul Lewis triumphs. It's as simple as that. To say I wish I played like him is the highest compliment I can pay an artist. I wish I did. This is a disk you play to your kids and say, "if you take piano lessons, maybe someday you too can sound like this." Of course someone like Paul Lewis is one in many millions or more. As such he is a model of the complete concert pianist. Brilliant! As those in the northern hemisphere experience the ebb of nature we contemplate a collection of the works of Heidi Jacob (b 1953) entitled aptly Beneath Winter Light (Navona 5985). She is a dramatic exponent of music that at times plays on the edges of tonality in a sort of post-Bergsian way, which is to say that her music is modern-expressive without quite being neo-romantic. We are treated to five of her works. The "Winter Light" duo for violin and piano and the "String Quartet I 'on enameled tablets,'" written in 2012 and 2009, respectively, both have a sort of mournful somberness, at least to my ears, and highly expressive string parts. The first work was inspired by the Bergman film "In Winter Light." The string quartet draws from the poetry of Czeslaw Milosz without attempting a literal representation of the verbal images expressed. "Regard a Schubert: A Fantasy Impromptu" (2008) creates a tone parallel to Schubert utilizing harmonized and unharmonized lines in an ambiguous way to create a powerfully poetic work for solo piano. "Fantasy" for piano (2005) was inspired by the structure and freedom of C.P.E. Bach's piano fantasies and also Milosz's poem "Tidings." Texture, gesture and lyricism are the prime concerns according to Ms. Jacob. It like the preceding work has a very pianistic sense and once more a flair for the dramatic in shifts of mood and density. "Salome Revisited" (2006) for electroacoustic tape concludes the program. Richard Strauss's "Salome" provides the source materials for this work. The soundscape created haunts in a very musical way. It is more about transformed tone than noise and so readily fits into this anthology of works. Pianist Charles Abramovic, violinist Barbara Govatos, and the Momenta String Quartet give us performances very worthy of the music. 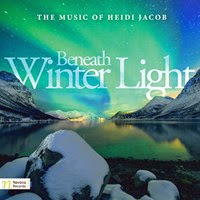 Heidi Jacob is a composer whose music very much bears hearing. She is a true artist. I hope to hear more of her work. Very recommended. The cauldron of stylistic amalgams continues to boil steadily, giving us various blends of new music and other once very disparate styles, now combining in nearly endless possibilities. Today we have an album that features a heady mix of new music and heavy metal rock, as played by the McCormick Percussion Group on Between Rock & A Hard Place (Ravello 7898). The centerpiece of the program is the Ciro Scotto work that furnishes the title to the album. It is a rather striking combination of heavy metal guitar (Corey Harvin as soloist), electric bass, drums and the percussion group. The music gives place to the rock ensemble and the many varied percussion instruments in equal measure. Riding the metal riffs in four movements is the electric portion of the ensemble, yet the percussion extends the music and gives it color and character it would not have otherwise. It works because Scotto finds a common ground where the music comes together. There is a second, unplugged version where guitar and bass play their parts acoustically and that too has much interest as a contrast and a very different outcome. With the advent of the percussion group new music was dramatically liberated from conventional classical timbres. The joining of the percussion sounds with heavy metal goes to show you how liberation makes it possible to go virtually anywhere given a cohesive conception, which is certainly the case with this work. Plus metal is about striking forward, hitting notes and chords percussively, and that makes it ripe for this synthesis. The rest of the album features works that have resonance in new music projection, but no rock elements, and that works fine as change of pace and contrast. John Cage's "Five" gets an unusual and interesting version for five players on a bowed vibraphone. Dan Senn's "Rivus" chimes in with a complementary work for celeste, glockenspiel and vibes that is about struck color, movement and tonality, and has trajectory that sets it apart as similar but different. 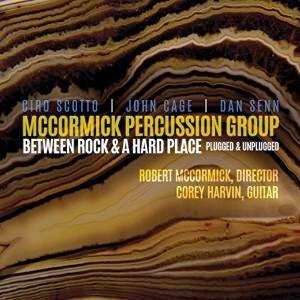 After the unplugged version of the Scotto work we get John Cage again with his "Composition for 3 Voices," an early work (1934), here realized for two vibes and marimba. This in all is music that engrosses as it transcends boundaries. The McCormick group is first-rate in every way and they shine forth brightly here in a program that will appeal to anyone with an open mind. Kudos! Jack Gallagher steadily is becoming an American composition phenom. Not by storming the gates of the inner sanctum, but by continuing to write works of well-crafted, inspired modern symphonic music. I last reviewed an album of his, Orchestral Music, April 7, 2011 on the Gapplegate Music Blog (before the blog you are reading became the conduit for classical music). JoAnn Falletta and the London Symphony Orchestra gave us exciting renditions of good works. 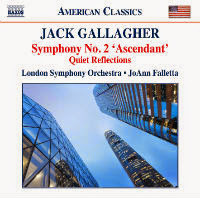 They return today for a new installment of Jack Gallagher's music, including his Symphony No. 2 "Ascendant" (Naxos 8.559768), written between 2010 and 2013. The new disk if anything shows an even more masterful Gallagher, tackling a long-form symphony with good ideas, orchestrational brilliance, and a cohesive sequencing worthy of your attentive ear. There is a long-lined melodic strain to the music that reminds ever so slightly of Harris at his best. There is pacing drama, repose at various points and some vivid orchestral fireworks too, when that is called for. We get as bonus the shorter work "Quiet Reflections" (1996). As the title suggests we are treated to a beautifully mysterious meditative calm, tender lyricism without sentimentality and perhaps a quietly searching quality. It is a welcome addition. As before JoAnn Falletta and the London Symphony are well-disposed toward the works. They give us expressive, enthusiastic and well-balanced readings of both pieces. Their hearts and minds are open to the music and they respond with disciplined elan. Falletta excels with this sort of thing, certainly! This is an ideal place to begin with Jack Gallagher if you haven't previously experienced his music. It is very worth your attention in any case. The trio of harp, flute and viola has a sound all its own. Debussy definitively produced the impressionistic reference masterpiece, his "Sonata for Flute, Viola and Harp" in 1915. 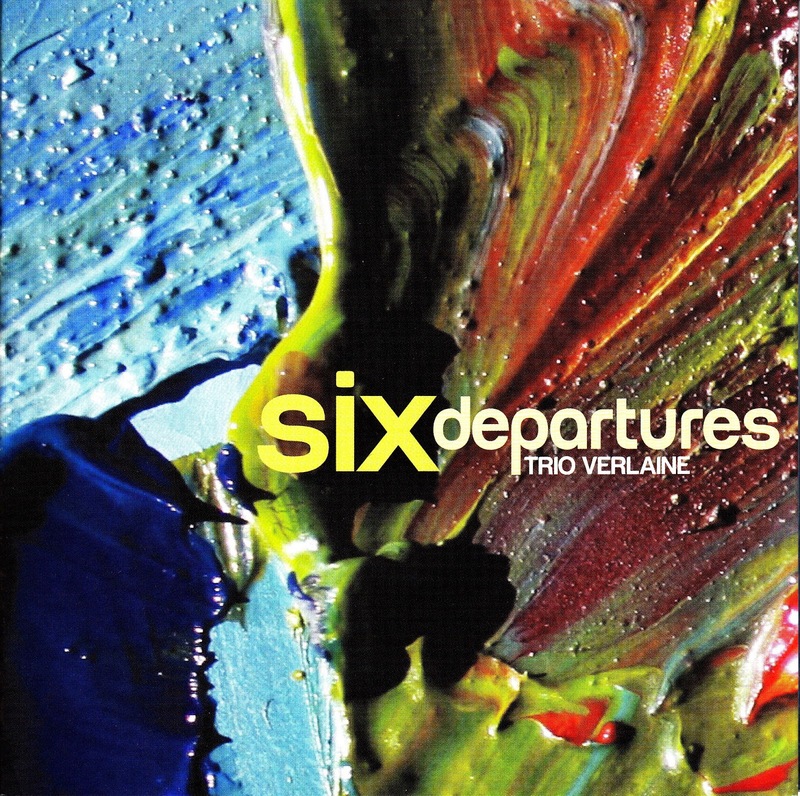 Trio Verlaine gives us four modern works that extend that sonic lyricism on Six Departures (Ravello 7895). These are played with care and enthusiasm by the trio, which consists of Lorna McGhee on flute, David Harding, viola, and Heidi Krutzen on harp. Two of the four works are first recordings and owe their existence through commissions on behalf of or directly by the trio. They are the late Jeffery Cotton's "Six Departures" and R. Murray Schafer's "Trio for Flute, Viola and Harp." The program is rounded out by composers of the 20th century in Sir Arnold Bax's "Elegiac Trio" and Andre Jolivet's "Petite Suite." What perhaps is most remarkable is how smoothly the four compositions flow together in the program. All have the pastoral impressionistic liquidity that Debussy established as a bellwether for the instrumental configuration. They all follow in the path with their own integrity of thematic presence, yet all are part of the lineage and belong well together. The Schafer work perhaps is the most modern-sounding of the four, but really all of the works have a sort of timelessness born of the instrumentation's haunting brilliance of sound, especially in the hands of so capable artists as Trio Verlaine. They sparkle with carefully balanced and meticulously phrased lyricism and so bring out the highlights and contrasts of these fine works. Anyone who responds to the ravishing beauty of a fair morning in early spring will respond to this CD. It is an experience to warm your insides on a cold day, or to affirm the natural world when it is blooming and buzzing. Very recommended. In an interesting place is a double CD set from composer-electronics person David Rosenboom and percussionist William Winant. 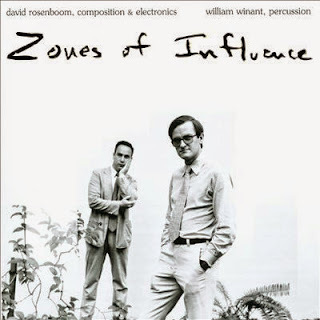 Zones of Influence (POGUS 21074-2) gives us a world of sound mapped out by Rosenboom in 1984-85 and revised in 2013. He calls it "propositional music." By that he means a modelling of cosmic universes that may have their own brains, may evolve, have consciousness, etc. He embodies the models in musical forms based on algorithms with the ultimate result that the world initially created becomes a musical composition or series thereof. "Zones of Influence" is a five-part work that exemplifies the approach. Winant plays on a battery of percussion instruments: snare, marimba, xylophone, metallic instruments, tabla tarong, vibes, timpani, etc. Rosenboom activates computer-generated musical instruments. He also devises the real-time interactive compositional algorithms and sound synthesis programs as well as plays auxiliary keyboard parts and violin, designs the percussion-sensor interface and puts the final sound result together as producer, engineer, editor, mixer, and mastering person. So that is the basis for the music we hear. In the end of course what counts is that the music satisfies our own musical listening sensibilities. It does. At times it sounds like an uncannily synched concerto for percussion and virtual orchestra; other times the blend between the two worlds is less percussion-centered (especially in parts of the second half) and it becomes an overall virtual orchestral matrix with percussion a bit less central and more ensemble-oriented. The results are exceptional. Much of it sounds very organic, thanks to Winant's vivid presence. But the spatial panning out of the music is rather otherworldly, which is of course the point. Rosenboom does indeed create his own world of sounds. They mingle together with a logic born of the algorithmic-generative specifics. In that way the music often seems less human-intuitive than is typically the case with real-time composition as we know it. Like with Cage and some of his chance-operation works, a human personality is not so up-front as is a sense of extra-human structure. The music does not sound Cage-like however. There is more in the way of synchronicity. To say it in less fanciful ways, it hangs together remarkably well as new avant music. It fascinates with its real-virtual interface. The music content remains at all times of high interest. The musical segment for tabla tarong (multiple tuned tablas) and electrical instruments alone is worth the price of admission, but there is much more. This is a landmark creation, a breakthrough for the melding of virtual and real-time instrumental combinations. It also is fascinating music on any terms. Very recommended. Classic era solo piano music has a certain self-contained quality. It seems to reach a little less into the future and back into the past as compared with the flowering of romantic and even modern piano music. It occupies its modest world with undeniable charm and lightness of being. Or at least much of it seems to. That doesn't mean we should dismiss it or not get to know it, of course. It helps sometimes to hear the music on a period instrument, in that the sound is less projective, more intimate, more in keeping with a performance less "stagey," with fewer people in attendance, sometimes just the pianist alone to hear it. With this is mind let's take a look at new new disk of piano music from that era, one with some decided differences than standard. I refer to pianist Patrick Hawkins and his Haydn and the English Lady (Navona 5981). 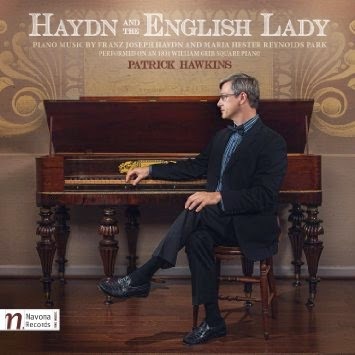 We have a selection of piano music by Haydn and the rather unknown composer Maria Hester Reynolds Park, as played on an 1831 William Geib Square piano. The piano has a less reverberant tone as one might expect. Its tuning in the upper register seems less tempered than a modern instrument, and that may have something to do with its age. Once one gets used to that all flows together. The Haydn is a Sonata in D Major, and an Adagio and a Capriccio. They are played quite decently and serve to set off the music of the "English Lady," Ms. Park. Maria Hester Reynolds Park (1760-1813) was of course a contemporary of Haydn (1732-1809). She was a pianist from aged 12 to 19 for the permanent orchestra in the Music Room at Oxford. She went on to teach privately to publish a number of her works during her lifetime. That is all we need to know for the moment, for the music is what is at hand. Our disk includes three of her piano sonatas, the one in E-Flat Major, Opus 4, No. 2; the F Major, Opus 4, No. 1; and the C Major, Opus 7. In addition there is a Waltz in E-Flat Major. That and the E-Flat Sonata come to us in first recordings. We certainly gain a good view of Ms. Park from these performances. The themes are very appealing, the music well-crafted. She may not have the grandeur and profundity of Haydn, but how many come close to him in that era? A very few. She holds her own nonetheless. Hearing the more familiar Haydn on the period piano gives you pause. He is not diminished by the intimacy of the instrument. The singing melodies still sing. The passagework has less presence though and so the thematics stand out all the more. The same might be said of the Park pieces, though I have never heard her music previously. She is no slouch. The hearing of her work is much to our benefit and this CD gives us a sort of in situ feel for her way, and for that matter Haydn's. It is a charming disk. Thank you, Patrick Hawkins! 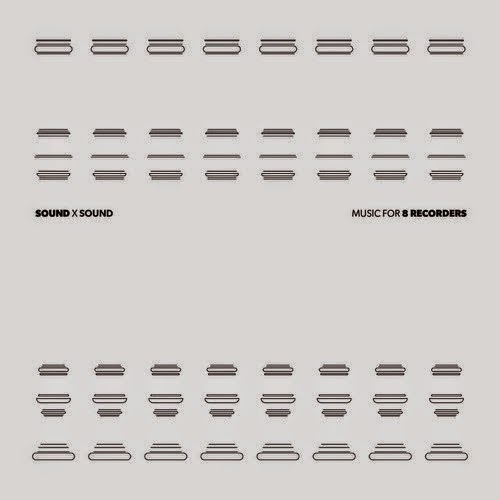 Danish composer Niels Lyhne Løkkegaard gives us a tantalizing slab of aural adventure on his inaugural Hiatus Records 7" vinyl release, Sound X Sound, Music for 8 Recorders (Hiatus 010). The format necessitates a brevity that refreshes via understatement. We get two different works, one for each side, all coming in somewhere under ten minutes. The first side is for eight soprano recorders. It proffers a rather dense jungle of turbulent, tonal sound. This is a recorder ensemble that creates a panorama of busy, fluttering, flighty sonics with a thick overall texture, a kind of high-vitamined avery. In the course of the short work the motives begin with longer phrases and transform into a series of rapid trills. The second work features eight alto recorders. It begins with continuous unison tones which gradually transform into trills that alternate with the root tone in a patterned pulsation that has soundscaped qualities as well as a regularity. The number of different trills increases until the sound is more chordal than drone and trill. In the end the recorders sound a sort of ritualized drone of root and third. The short, unassuming nature of the two works charm and give you a sound world both intimate and expansive. The mini-concert ends with you wanting more. Apparently next on the docket for Løkkegaard is music for multiple chromatic tuners. This is a fun adventure! As much as this is my first post of the year I'd like to wish everybody success and happiness in 2015. Today's post looks backward slightly to 2011, when a mammoth earthquake and tsunami hit Japan with a devastating blow. 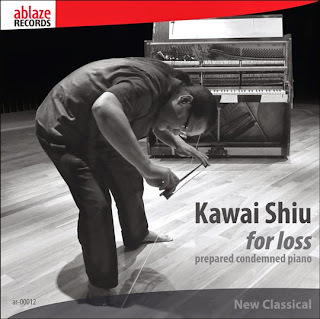 Composer Kawai Shiu was out of the country at the time but very much moved by photographic images of one of his colleagues (who was engaged in the work of cleanup and restoration) on a beach playing on a badly destroyed piano which had washed up with other debris in the wake of the cataclysm. It very much affected Shiu as a kind of symbol of the havoc wreaked. In time he envisioned creating a work that dramatized the horror and grief he felt in concrete, performative terms. 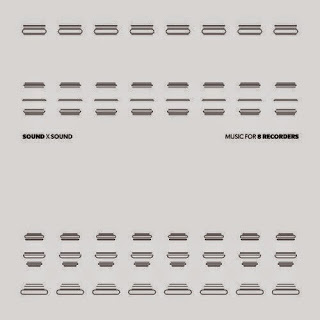 For Loss (ablaze 00012) gives us the music as he imagined it. It is for what the composer calls "a prepared condemned piano." Shiu set about to find a piano that was in as similar a state of extreme disrepair as the one that washed ashore. As you can see from the cover picture, the keyboard and strings are still there, but that is more or less all. 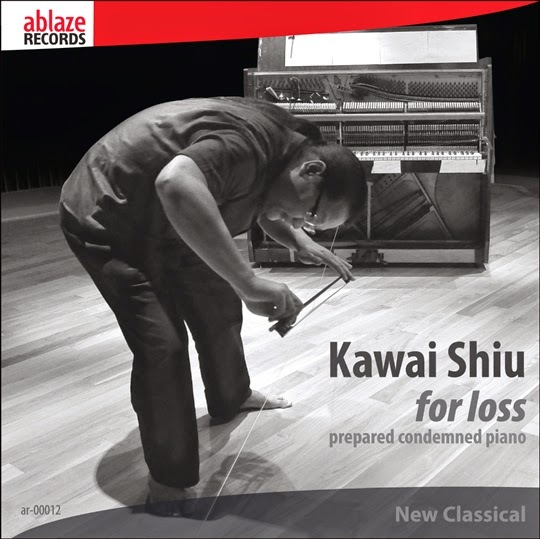 Shiu's work presents 19 sections that employ various means of sounding the damaged instrument, from playing on the carefully detuned-retuned strings in the conventional way to getting inside the strings with various objects, strumming and hitting them and, as again you can see from the cover, bowing a string that had become detached. I don't have the details on further preparation but the sound of the work tells us that there was a fair amount of it. It is a kind of ritualized representation in sound of all that was lost in the disaster. It is more contemplative and sound-color oriented than it is expressionist. It in a way seeks to restore nature as a creative force, to make a mournful but ultimately positive musical statement about making good with what is left. It is music of an otherworldly cast, paradoxically built from the ruins of the present to create what sounds like music of some ancient rite. Yes, there is great loss expressed in the work, but there is the transcendence of re-creation. The work fascinates in its stark ritualized action. The more one listens, the more one gravitates toward the sounds so well thought-out by Kawai Shiu. It has a one-of-a-kind quality that is in the end a tribute to the bravery of those who got through the upheaval and surged forward to rebuild their lives. In that, it is a work highly representational. All sounds have meaning yet are singular within themselves. Hearing is a moving experience. Listen!